Welcome home to this private wooded farmhouse style retreat. 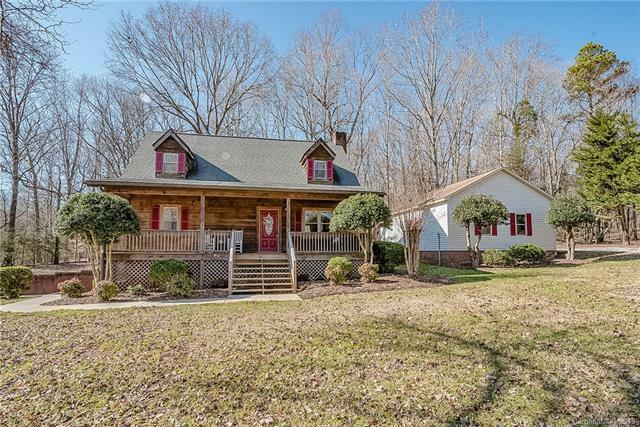 The home is recently updated and quietly nestled on 2.62 acres. Relax on the rocking chair front porch or back screened room. Detached 2+ car garage & basement shop/garage offer limitless workshop opportunities. The wood beams stretch through the entire living area of the home. Pine log walls, new flooring, new kitchen, and open living space give the home a welcoming feel. The kitchen features all new wooden/ soft close cabinetry, updated fixtures, and new stainless appliances. Master Bedroom is a tranquil retreat which features an updated Master Bath with jacuzzi tub, tile & dual vanity. The home also features new flooring, new doors throughout, recently updated windows, updated 2nd level bath, skylights and an open concept. The open loft area upstairs overlooks the great room; and is fitting as a library, office or reading nook. Easy access to interstate 40/77; only about 6 miles to Statesville. Sold by Excel Real Estate Group. Listing information © 2019 Triad MLS, Inc. of North Carolina. All rights reserved. The data relating to real estate for sale on this web site comes in part from the Internet Data Exchange (IDX) Program of the Triad MLS, Inc. of High Point, NC. Real estate listings held by brokerage firms other than RE/MAX Impact Realty are marked with the Internet Data Exchange logo or the Internet Data Exchange (IDX) thumbnail logo (the TRIAD MLS logo) and detailed information about them includes the name of the listing brokers.IDX information provided is for consumers' personal, non-commercial use and may not be used for any purpose other than to identify prospective properties consumers may be interested in purchasing. Information deemed reliable but not guaranteed. Data last updated 2019-04-25T10:30:42.637.